Earlier I did a post on roasted beets. 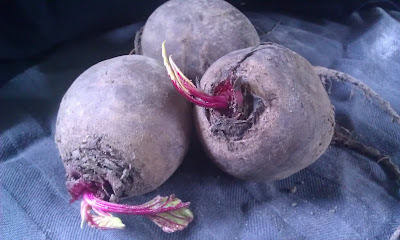 That was my first attempt on roasting beets and I think that roasting is now my favorite way of preparing beets. But, as with almost everything else, you need to try some different flavors, otherwise things get boring. It turns out that goat cheese is a great companion for beets. Along with a tiny hint of sweet and sour. This salad is one of my favorites. It's full of flavor, but still light and very easy to make. There aren't a lot of ingredients, because I believe that with this combination of very flavorful items, less is more. Preheat an oven at 400 F (200 C). Peel the beets and cut them into wedges. Pour about 2 tablespoons of oil (olive, ghee, whatever you prefer) into a baking tray. Toss the beet wedges in the oil. Cover the tray with tin foil and bake for 35-40 minutes. Take the tray out of the oven, and take the foil off. Mix the vinegar with the honey and pour on top of the beets. 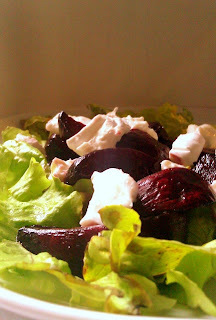 Toss the beets again and make sure that most of them are covered with the vinegar/honey mixture. Put back in the oven, and bake, without the foil, for another 15 minutes. This caramelises them, making them sweet and shiny. Let them cool (this will only take about 10 minutes). Place a handful of salad greens on a plate and put the caramelised beet wedges on top. If you have some juices left in the baking try, you can use this as a dressing. Just pour some over the beets and leaves. Finally, crumble the goat chees on top and you have an amazing salad!